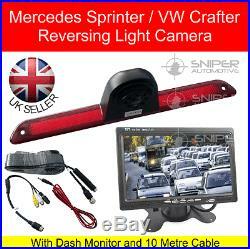 BRAND NEW & BOXED BRAKE LIGHT REVERSING CAMERA KIT FOR MERCEDES SPRINTER (2006-present). Eliminate blind spots and get best viewing angle with this high quality high level brake light camera kit for Mercedes Sprinter (2006 onwards) or VW Crafter (Pre 2017 only) vans. 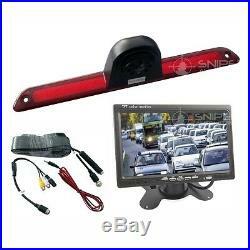 This camera simply replaces the original high level brake light lens to give you a neat OEM look reversing camera, it comes complete with a 10 metre cable and a dash monitor with stand. Simple to fit an comes complete with a 3M foam seal to prevent water ingress. The 70cm lead from the camera connects to the included 10 metre cable which has an adapter at the other end to break out into power and an RCA/phono socket to connect to the monitor. Just connect the two wires for power into the vehicle electrics and optionally a third wire can be used to automatically switch the monitor on when selecting reverse. 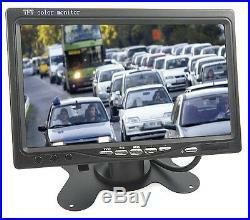 Dash Monitor with 7 Screen. 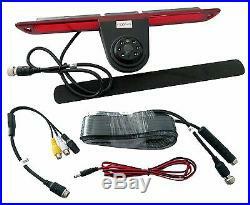 Brake light camera with Sony CCD Chip. Camera is waterproof to IP68. Power Supply DC 12V DC. Camera dimensions : 119.5 x 307 x 33.8 mm. Monitor dimensions 170 x 112 x 20 mm. UK Supplier - NO Import Duty to pay. We are not just another box shifter, we are familiar with all our products and the day to day installation of them so unlike many of our competitors we can offer full technical back up and customer service. With over 20 years experience in the automotive accessories industry backed by our excellent service we don't believe you will find better, on or off the internet. Terms & Conditions Please see our full Terms & Conditions. The item "Mercedes Sprinter/VW Crafter Rear Brake Light Reversing CCD Camera Kit" is in sale since Wednesday, April 26, 2017. This item is in the category "Vehicle Parts & Accessories\In-Car Technology, GPS & Security\Parking Assistance\Camera, Monitor & Sensor Kits". The seller is "sniperautomotive" and is located in Various.